So, how to find my top 5 posts of 2015? 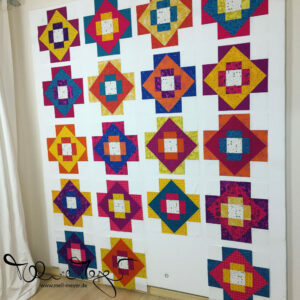 …were two activities connecting me to other quilters, new sewing friends. I am really grateful for these. I joined the Quilty Circle of Bees founded by Daniela @ Block M Quilts. You can find some more information about the bee here. We are six people in total. And the second is a sewing meeting „Modern Patchwork Treffen“ that Allison from @ Campbell Soup Diary & I started – and if you are from Hamburg or Northern Germany and interested … well we are happy to hear from you! I had „only“ two quilt finishes this year. I often doubt my productivity when I sew the stuff other blogger do out there. So many great quilt finishes. Lots of lovely projects: Pillowcases, zipper pouches… And don’t get me started on regular blogging, tutorials or even patterns. I am still working on my two big projects Aviatrix Medallion and Skill Builder BOM. And with a fulltime job and normal life, sewing time is limited. So I am learning to be happy about the finishes. … were left on this WIP Wednesday post. Even if it may not sound like a lot of comments – I love each and every one you leave here. They are treasured! The second idea why I think this post has to go on this list is: It contains two of the huge time sucking things I did this year – and it’s from the linkup where the TOP 1 started. And it shows on of the big projects already mentioned above. They will reappear in 2016 for sure – and on the 2016 goal list still to be written in the next days. Additional to those TOP 5 and to keep the review complete: I finished my first Charity Quilt and a Poolside Tote. So let me again say „Thank you!“ for the new quilty friends and the lovely comments. Hope to „see“ you again a lot in 2016. All the best wishes to you and your family for the new year! Wow! Gorgeous work! The round quilt at the bottom is amazing! Great posts! I need to make one of those velcro Kona cards, what a great idea! I just started following you on Instagram (I am @ MeadowMistDesigns) Thanks for linking up. You have a way with color, Melanie! These are great makes. I wish you all the best in 2016! By the way, thanks for the lovely comment you left on my blog. I sent you a reply, but it bounced back. Your designs and fabric selections are divine!! I can’t wait to see the magenta/teal/gold quilt finished as it is gorgeous!!! 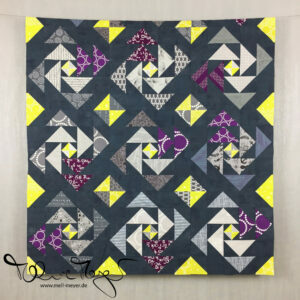 Wow, that Aviatrix quilt is fantastic! Cant‘ wait for the blog post about it! And how could I miss your tutorial of how to make that Velcro Kona ColorCard? That is so cool, I have to make that too!! 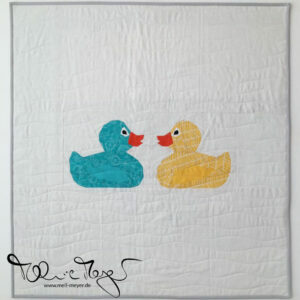 Your finishes are great, and I’m also very happy to have you as my fellow quilting bee!! I love your two finishes and your Technicolor Galaxy project looks awesome! I love the color palette that you chose. I really wanted to do this one, but just couldn’t take on another big project.